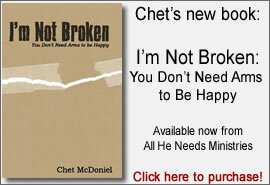 Chet McDoniel is a Dallas speaker with a message of hope, happiness and a full life. Chet was born with no arms, however, his disability has never gotten in the way of Chet achieving his dreams. As a Dallas speaker, Chet has inspired thousands to get past the barriers in their lives, and to have a positive attitude no matter what comes your way. From his unique perspective, Chet offers insight on what it takes to deal with challenges in life whether they are big or small. He believes a smile conquers all. We encourage you to read more about Chet McDoniel – Dallas Speaker by looking around our site. If you are interested in bringing Chet in to speak at your event, we invite you to click here or choose “Contact Information” from the menu above. As a Dallas speaker, Chet offers special rates for Dallas/Fort Worth area events, and has no travel expenses for events in this area. Thanks for visiting, and don’t forget to smile!